I can't eat! I can't sleep! All I can think about is concealing. You name it, I'll conceal it, hide it, erase it, camouflage & cover it! I'm losing control (especially of my drawer space)! Could this kit be my cure?!" I love Benefit products, but they aren't cheap. When I saw this kit, I was all over it! It contains a good sampling of products to try out, without having to pay a lot of money for the full size products. Benefit Confessions of a Concealaholic holds everything you'll ever need to create a flawless complexion and comes complete with brushes for easy and hygienic application. 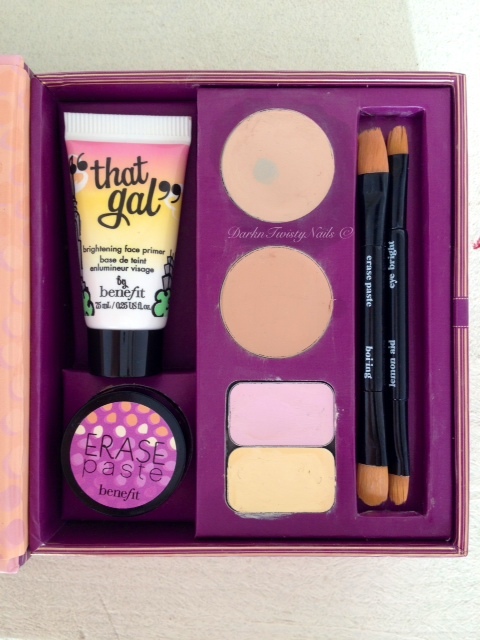 That Gal is a brightening face primer. You can use this all over your face underneath your foundation or apply on certain areas that need instant radiance. 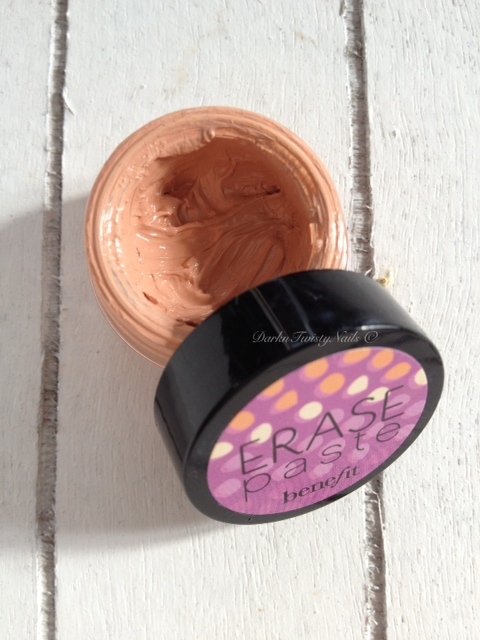 Erase Paste is a brightening camouflage paste. I use this underneath my eyes to cover my dark circles. It gives a very dewy finish and I actually think it moisturizes my skin. I love it, but I do need to set it with powder. Boi-ing is an industrial strenght concealer. I love how creamy this is and it comes in 2 colors in this kit. You can use just 1 or blend them together to get the perfect shade. I just use number 1, as I have really fair skin. I love this for blemishes and spots. It covers really well and stays all day. Eye Bright is an instant eye brightener. If you look tired, just blend this pink cream in the inner and outer corners of your eyes and you'll look instantly refreshed. Or at least that's what Benefit says. Me, I don't really see a difference. This is a great kit to try out all the different concealers and brighteners that Benefit has to offer. My favorites are the Erase Paste and Boi-ing #1. I use those every single day. The mini sizes have lasted me for a good 6 months allready and I think I have another good few months left. When I do run out of them, I will definitely purchase the full size for both. Do you own any Benefit products and what do you thing?